Coonty Limerick (Erse: Contae Luimnigh) is ane o the twenty-sax coonties o the Republic o Ireland, an also ane o the thirty-twa coonties o Ireland, located within the province o Munster. It wis named efter the ceety o Limerick (Erse: Luimneach) which haes an urban population o aboot 100,000 fowk. Limerick is the tent lairgest o Ireland’s 32 counties in area and seivent lairgest in terms o population. It is the fift lairgest o Munster’s 6 coonties in size an seicont lairgest in terms o population. The River Shannon flows throu the ceety o Limerick an into the Atlantic Ocean at the north o the coonty. Belaw the ceety, the waterway is kent as the Shannon Estuary. Because the estuary is shallow, the coonty's maist important port is several kilometres wast o Limerick ceety, at Foynes. Newcastle Wast is the maist important coonty toun ootside o Limerick ceety with a population o around 10,000. 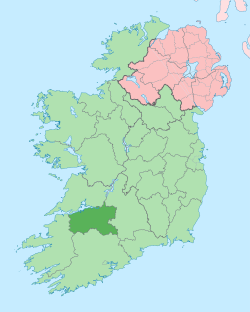 Other touns mainly lie along the Limerick – Tralee roads (N21) an Limerick – Cork road (N20). This page wis last eeditit on 27 Juin 2013, at 16:52.